San Francisco is the only venue for this exhibit. Even before I saw this remarkable exhibit, I decided that I would begin this review with a question: Have you ever been to an exhibition called Men Impressionists? I haven’t either. The male artists in those shows are simply referred to as Impressionists. So why segregate these talented artists, Berthe Morisot, Mary Cassatt, Eva Gonzales and Marie Bracquemond into a discrete category? According to the Legion of Honor’s director and curators, these four painters were marginalized by their gender and cloistered by Parisian social mores of the late 19th century, although they were part of the Impressionist circle. For decades, they were not given the critical approval they deserved and were not the subject of major shows. Now, Women Impressionists at the Legion of Honor gives us the rare opportunity to directly compare the artists and learn more about their art, their lives and their place in late 19th century French society. Women Impressionists fulfills those missions very well and the exhibition is a pleasure to see. However, if gender is the main connection among these artists, it would have been interesting to see some “men” Impressionists’ paintings as well, if only for the sake of a broader and more integrated comparison, and to tilt the emphasis more towards the art and less to the back story of the artists. Mary Cassatt (1844-1926), the only American in the show, studied in Pennsylvania and throughout Europe before settling in Paris. She was a close friend of Degas and participated in four of the Paris Impressionist exhibitions. Cassatt is most well known for her lovely portraits of cherubic children and their mothers. But her Japonesque drypoint aquatints are exquisite, especially The Letter and The Afternoon Tea Party. Berte Morisot (1841-1895) was the only woman in the first Impressionist exhibition and continued to show at seven out of eight of the Paris exhibitions. Married to Manet’s brother, close friends with Renoir and taught by Corot, she frequently painted landscapes and outdoor scenes. 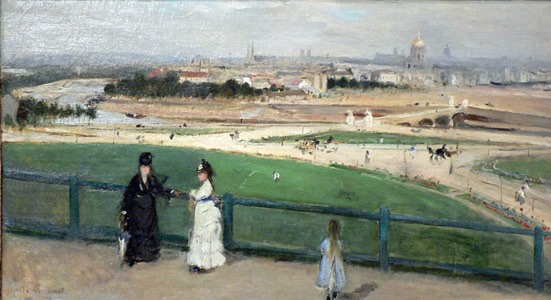 In her View of Paris from the Trocadero, one can observe the influence of these artists, yet her unique talent shines though. Over sixty examples of her works, including oils, pastels and drawing are shown at the Legion of Honor. The premature death of Eva Gonzales (1849-1883) at age 34 leaves us wondering what more she might have accomplished had she lived longer. She was the only formal pupil of Manet’s, much to Morisot’s annoyance. Like Manet, Gonzales never exhibited with the Impressionists. Gonzales’ forte was portraiture. She includes subtle emotion and sensuality in her works, which are notably displayed in The Chignon and A Loge in the Theatres des Italiens. The latter work was considered one of the most provocative of its day. Marie Bracquemond (1840-1916) is less well known than her contemporaries are. She was not from the privileged class and was largely self-taught, although later in her career she was advised by Gauguin and Sisley and participated in several Impressionist exhibitions. Many of her works were painted in her home and garden, notably, On the Terrace at Sèvres. Her husband, Felix Bracquemond, a well-known artist of the day, but an overbearing spouse, discouraged her to the point that she stopped painting by 1890. From her approximately twenty pieces in the exhibit, one can appreciate her mastery of the Impressionist style and her brilliant use of color. In this large, attractive and straightforward show, each artist’s work is displayed individually in warm, well-lit galleries that subtly merge into the next artist’s display. The separate, yet dovetailing galleries mirror the relationship among the women, who were in the same circles, but were never intimates.